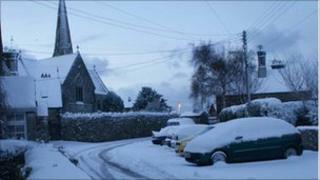 Image caption Around six inches of snow fell in Llandwrog, near Caernarfon. Ferries have been cancelled, a crematorium closed and cars abandoned after heavy snowfall in north west Wales. Services at Bangor crematorium have been re-scheduled for next week following 12 inches of snow, with Anglesey and Bangor worst affected. Police are warning drivers to take care on roads and nearly all are passable. Meanwhile, non-urgent operations and outpatient appointments have been cancelled at Ysbyty Gwynedd in Bangor. Glan Clwyd Hospital and Wrexham Maelor Hospital are open as normal. The 1000 GMT Stena Line ferry service between Holyhead and Dun Laoghaire was cancelled due to the arctic weather conditions. Gwynedd council said its gritting teams were working "tirelessly" to keep the county's priority routes open. However, services at Bangor crematorium on Friday have been re-scheduled for next week. The council apologised for any inconvenience. It added that refuse and recycling collections had been cancelled, while all 17 of the county's public libraries were closed, and the mobile library was not running. Eighty-three schools are also shut. The council said its offices were open for "essential services only". BBC Wales reporter Wena Alun said only 4x4 vehicles seemed to be venturing out. She added: "It rained and then froze before the snow fell, so it looks nice and fluffy, but it is really slippery when you try and walk or drive on it. "But it has stopped snowing for the time being and we can see the sun. "In Caernarfon there is a steep hill, and people are leaving their cars at the bottom and trying to walk up. "I've spoken to the head teacher of Llandwrog village school, who lives just outside Caernarfon, and she said people there are leaving their cars and trying to walk into town. "I'm not sure how far it is, but it must be a walk of half an hour to three quarters of an hour in these conditions." All non-urgent operations and outpatient appointments have been cancelled at Ysbyty Gwynedd in Bangor. Kidney and cancer patients due at the hospital were being contacted by the health board. Glan Clwyd Hospital and Wrexham Maelor Hosptial are open as normal. Meanwhile, rail services in north Wales are facing delays. Trains between Holyhead and Chester, Pwllheli and Shrewsbury and Wrexham central and Chester are affected. On the roads, the A470 at Bwlch Yr Oerddrws is closed in both directions between the A458 at Mallwyd and the A487 at Cross Foxes. But the A470 Crimea Pass has re-opened after snow was cleared between Glanypwll Road at Blaenau Ffestiniog and A5 at Betws-Y-Coed.